We suggest sending bridal shower invitations and baby shower invitations 4 weeks before the event date…read more. The bride determines the guest list for the bridal shower. When creating this list, the bride should provide…read more. How do I word bridal shower invitations? You can be as formal or as casual as you like, just remember to have all the important details such as…read more. Speed of shipment can vary depending on what you purchased but generally our customers are very happy if not surprised at how fast they receive their orders. Most invitations take 1-2 business days to print and up to seven days to ship…read more. Our bridal shower invitations are as diverse in style and personality as the brides they're celebrating. Today's showers are more than just another bridal event after all; they honor the bride and her unique sense of style. 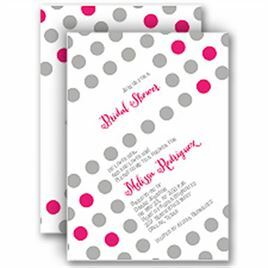 Here at Invitations by Dawn, finding the perfect bridal shower invitations to fit the bride's personality is easy because there are so many stylish designs to choose from. 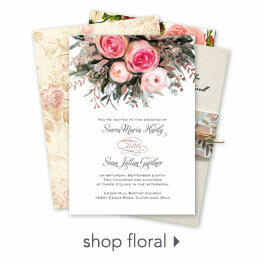 Elegant, sassy, sophisticated, fashionable…whatever her taste, we've got invitations to match! Perhaps you're planning a couples shower for the bride and groom. You'll find a great selection of fun wedding shower invitations. Oh, and let's not forget thank you cards, a must-have for every shower. You will find some of the most beautiful designs available for shower celebrations in our collection of watercolor bridal shower invitations. Enjoy browsing a variety of designs featuring vibrant color and artful illustrations from gorgeous floral arrangements to modern geometric patterns. With such a large selection to choose from, you will thoroughly enjoy shopping the watercolor collection. You will even find some watercolor designs in our collection of thank you cards as well.